Despite my best efforts, for the first time ever, this spring my hives threw two swarms. More specifically, the colony in the middle of the group threw both swarms. Not only did it swarm once, but a week later it threw an after-swarm. An after swarm is where once a colony swarms, the population is still strong enough to support another swarm (and the colony has extra virgin queens) that they swarm again. We caught the first swarm, and missed the second one by about 2 minutes. As we were suiting up to catch them, they moved on, having only been clustered on the branch for 20 minutes (we saw them swarm from the hive and land on a branch in the yard). Here is a picture of how the bee yard at my house looks today. You may be thinking, "wait, I still see 3 hives, what is different?". The middle hive stand is empty. That middle colony that threw two swarms left themselves with about 8 frames of bees. They dwindled rapidly down to only 2 frames of bees within 2 weeks time, despite a queen trying her best to lay eggs and rebuild the population. Then Small Hive Beetles overtook the colony and all 20 frames were crawling with larva. I shook out the now 2 frames of bees (they'll find their way into one of the other hives in the yard I'm sure) and froze the two deep hive bodies in the deep freezer for 8 days. If you do this, make sure you put the frames into a trash bag, apparently the larva will try to escape the cold by jumping out of the frames, and thus, will line your freezer with frozen Small Hive Beetle larva. So put the frames in a bag before putting them into the freezer. After the frames sat in the freezer for 8 days, I moved a nuc I've had since the spring splits into the now empty full size hive. They've been busting at the seems and trying to swarm, in fact, they may have, I couldn't find the old marked queen, and instead found a virgin queen already laying eggs, so I marked her. 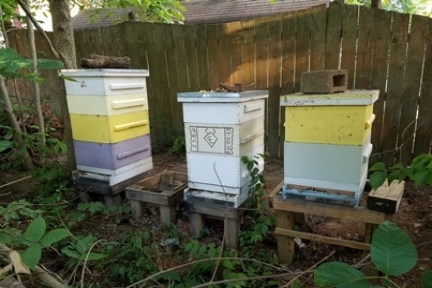 The nuc is now in a full size hive (pictured on the far right in the picture), taking up 15-18 frames of space already (could you imagine them all fitting into a 5 frame nuc!). You may also be wondering, "hey- didn't you have two nucs from spring splits?". You'd be correct. I sold one of them a month ago. All 3 of the colonies are doing well, have good population to them and they are all queen right. Soon I'll consider mite treatment and then wait for the fall harvest. So exciting! We missed our second swarm by a couple of minutes, too. But I caught the 3rd one! It amazing how much reorganization happens in a healthy bee yard every year. I had no idea things could get so exciting week after week. It's my understanding that if there is a brood break due to requeening or swarming, you don't have to treat that year because that has been enough to disrupt the varroa cycle. I've heard some beeks say that's another reason to requeen every hive every year. Interesting. What are your thoughts about that? I do agree a break in the brood cycle helps reduce varroa. However, I don't think my breaks in the brood cycle (this time) were long enough to make a significant impact. I'll probably be buying more MAQS and treating this summer. Right now Small Hive Beetles are threatening to take over...I've never seen so many of them. I just read an article about Monsanto in a trial with 2,500 bee hives around the US using RNA to target and kill varroa. I wish I was involved in the trial, but I wasn't asked or invited. I will be keeping an eye on their results, though, it sounds very promising. You should see a captcha above. If you don't, your network or browser is likely blocking it. Your comments will not appear until they're approved.